MOHAA Revival Edition has been released as a free download by the MOHAA Revival Community! It includes Medal of Honor: Allied Assault and its expansions Spearhead & Breakthrough. Each game is ready to play out of the box and is patched with the latest official updates and community patches to keep the in-game server browser working for multiplayer play. It also comes loaded with community written utilities to help you get the most of the game. Check it out! Just double click on the desktop shortcut to play either single-player or multi-player. Can't Find Servers In-Game? THERE IS A SOLUTION! On July 16, 2014, GameSpy support was shutdown for Medal of Honor: Allied Assault (MOHAA), Medal of Honor: Spearhead (MOHSH), and Medal of Honor: Breakthrough (MOHBT). Other games that relied on GameSpy technologies have also been affected. GameSpy powered the in-game online server browser. Due to the GameSpy shutdown, Medal of Honor game servers can NOT be found, filtered, or queried in-game from the multiplayer menu without the new patch or by using the other solutions listed below! In order for the in-game server browser to work today, you must patch your Medal of Honor game(s) to use our new master server. Patching your MOH games couldn't be any easier. Simply download and run the Game Server Browser Fixer Patch. Click on the big "Patch Detected Games" button. You're done. In-game server browsing should work again! Thanks to Razor and the dev team at www.x-null.net, there is a solution! Download, install, and run the Medal of Honor: Query Launcher desktop application to find and join all Medal of Honor game servers. Easily manage & favorite game servers, search for players, search for servers, browse gametypes, search by IP address, or export the list of online Medal of Honor servers directly into your clipboard! Medal of Honor: Query Launcher is free and includes many customizable options! Find, browse, add servers, and join Medal of Honor Servers through your browser using the MOH Reborn Server List Website at http://www.mohaaservers.tk/. Due to recent complaints about hackers, own3mall has implemented a sub-administrator section to moderate the servers. You can now also appeal bans, read forum posts, and check out our rules. All sub-administrators are listed in the forums, and you can also apply to become a sub-administrator. Permissions are limited, and your activities are logged. Do not abuse your power. For more information on what this mod can do (everything), click here. Elgan's Elgbot stats mod that is used in our FFA server with Unreal Tournament sounds for KILLING SPREE, HEADSHOT, MULTI-KILL, and more. To install, extract the sounds folder and the .pk3 file into your MOHAA\MAIN. You don't need the mod to play in our servers, but by downloading this mod, you'll have the cool sounds that come along with it! Everyone in the lobby will now use the server! NOLF Revival Edition has been released as a free download by the NOLF Revival Community! Download modernized up-to-date versions of No One Lives Forever (NOLF1) and No One Lives Forever 2 (NOLF 2). Each game is ready to play out of the box and is patched with the latest official updates and community patches to keep the in-game server browser working for multiplayer play (NOLF 2 only). 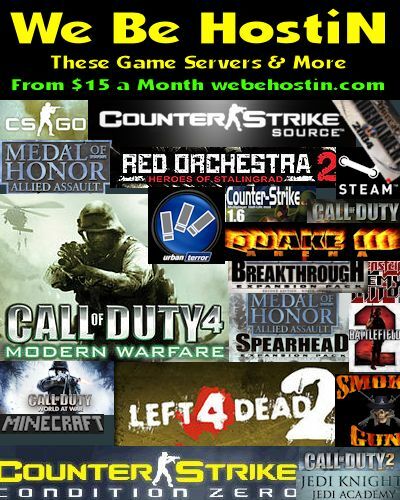 We Be HostiN (http://www.webehostin.com) hosts dedicated game servers for less! We Be HostiN can host any games that have dedicated server files.